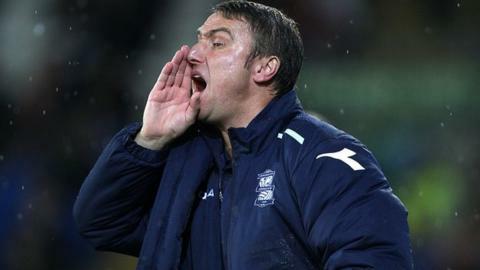 Birmingham City manager Lee Clark insists that he bears no bitterness towards his old club Huddersfield Town when he meets up with them on Saturday for the first time since being sacked. Clark's dismisssal in February was a big shock to neutrals at the time. But Clark told BBC WM: "We've all moved on. They've kicked on as a club and I've ended up getting a fantastic job myself here with Birmingham City. "It hurt, but the only reason for that is because I had a job I loved there." Although upset at the time to be sacked when his Huddersfield team had lost just three of their previous 63 league matches, Clark blames the media for suggesting that there might still be any bad blood between him and the man that sacked him, Terriers chairman Dean Hoyle. "People in the media try to make something out of it," added Clark. "But you'll never get me saying a bad word about Huddersfield Town. "I had a fantastic time there. They're a great club, with great people and great support and I had a good relationship with the owner. "We keep in dialogue, whether with a text or a call, and that will never change. "Me and him are the two people involved and we know that everything's fine." After going second in the Championship with a stunning televised 3-1 win at Blackpool 10 days ago, Huddersfield have slipped to eighth going into their reunion with Clark's Blues, on the back of successive home defeats by Leicester City and Watford. But Clark knows that Terriers boss Simon Grayson has built a team to be reckoned with on the back of last season's promotion from League One and the money raised by the consequent sale of top scorer Jordan Rhodes. "I'm delighted at the way they've started this season," added Clark, ahead of Saturday's Championship clash at St Andrew's, which is also a reunion for his backroom team Terry McDermott and Derek Fazackerley. "They've had one or two results they've not been happy with, but they were brilliant against Blackpool, had a terrific result in the local derby with Sheffield Wednesday and were very unlucky at Cardiff on the first day of the season. "But there's no extra incentive playing Huddersfield Town. We see it as just another chance to get three points and we'll be treating them with the same respect we give every team we play." Of more concern to Clark might be the fact that it is Blues' first home game since their embarrassing 5-0 battering by another Yorkshire side, Barnsley. "We've erased that from the memory," insists Clark. "We watched it, because we had to, and there were a lot of aspects where we went wrong. "In fact, in every facet of a football match, we went wrong. "But that was our one blip on the way things have gone over the last six weeks." Certainly, having bounced back to win 1-0 at leaders Brighton last weekend, Blues were considered unlucky to not have got something at new leaders Cardiff in midweek. "Four points from two games would have been the return that we deserved," said Clark. "But there are lots of positives to take from Tuesday night."